Proximus is a telecommunication and ICT company operating in the Belgian and international markets, providing services to residential, enterprise and public customers. They are the leading provider of telephony, internet, television and network-based ICT services in Belgium through our Proximus and Scarlet brands. Their advanced interconnected fixed and mobile networks offer access anywhere and anytime to digital services and data, as well as to a broad offering of multimedia content. The mission of Proximus is to connect everyone, enable better living and smarter working. Clearly, it was important for Proximus to put the money where the mouth is, and apply those principles themselves. “Mobility is an important part of our digital work environment, it means being able to work on any device, anytime and anywhere. Awingu supports this approach. It enables you to consult older systems, even if you are on the move,” says Margaret Denis, Manager Digital Workplace program at Proximus. This flexibility, responsibility, and culture of collaboration is possible with Awingu, and this helps Proximus’ teams focus on the customer in everything they do. Proximus employs over 14 000 employees. It has a wide and diverse network of people working not only from the office but also from other environments, like other companies or in the field. The ‘shop-in-the-shop’ is an example of the first. Here, Proximus sales reps must use the computers provided by the ‘shop owner’. “As Proximus employees at Fnac, we use Fnac computers to work. To access the Proximus intranet, we use Awingu,” says Joanne Gossiau, Sales Team Coordinator. “Awingu is not just available on PCs here but any place and any device – whether it is a smartphone, a tablet or a personal laptop. All you need is a login, password and a token. Awingu is really user-friendly”, she concludes. Mobile workers, such as field technicians, also rely on Awingu. It enables them to do their job faster and in a secure way, leaving behind the “old devices” they had to carry around. Now all they need is a tablet and Awingu. “With Awingu, my work is much easier than before. We used to have a much heavier laptop that was harder to carry around. Now we use Awingu on a tablet to fill out our checklists in the field,” says Ronny Vanlangendyck, Team Manager IPP. This is where Awingu excels in easiness of use. With a simple login, password and a token, Proximus employees can access their applications no matter the device or location. 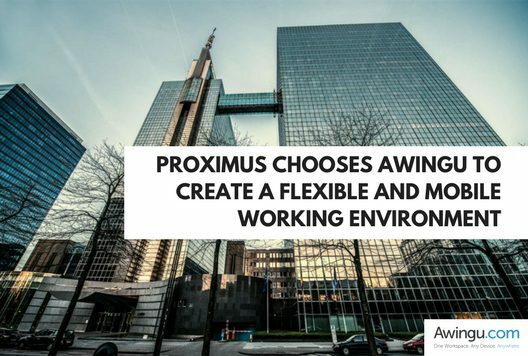 Next to using Awingu internally, Proximus is also a reseller, Proximus offers a full support in deploying Awingu for their customers. “Thanks to our experience with Awingu, we can quickly implement this solution for our customers, guide them in new ways of working and make their team members mobile,” explains Rolan Linsen, ICT Solutions Manager. Want to find out more about the Awingu solution? Are you interested in becoming our partner? Reach out to us at info@awingu.com!